This Model J is an affordable way to get into the Duesenberg club. The pre-sale estimate is a paltry $350,000-$425,000. I happen to really like this bodystyle, but it isn’t really the most sought after. Part of the reason is that this is not the original body that went with this chassis/engine. And the restoration is an old one. The body was originally a Derham Sedan but this LeBaron Convertible Sedan survived better on the chassis it was on. After sitting outside for a long time, the two Duesenbergs were turned into one complete car and this body made the transition. Ownership is known from new and this car has been in some big collections since the late 1960s. If you’re looking for an easy way to get your hands on a Model J, this is your ticket. It’s a nice, clean, drivable car recognized by the Auburn-Cord-Duesenberg museum. You can read more about it here and check out more from Gooding & Company in Amelia Island here. 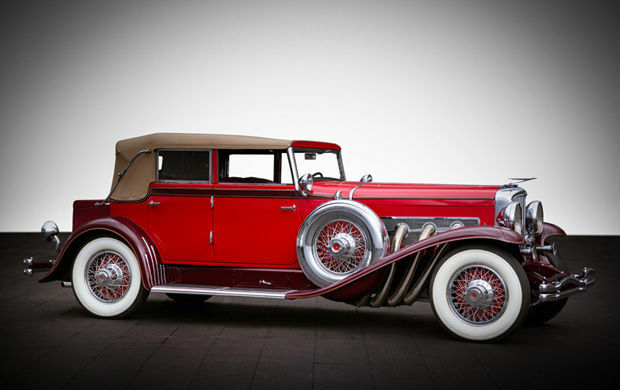 This entry was posted in Uncategorized and tagged 1931, auctions, cars, classic cars, convertible sedan, duesenberg, gooding & co, j-338, lebaron, model J by ClassicCarWeekly. Bookmark the permalink.